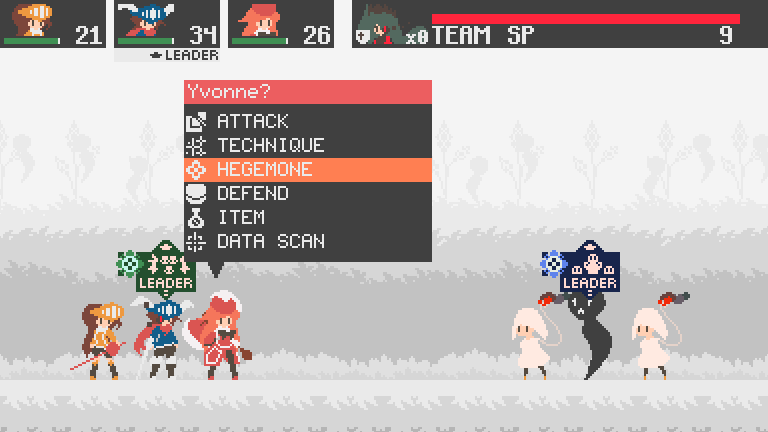 Hegemone Pass is a turn-based RPG with switchable leaders, who in battle use their title’s influence (a collection of stat boosts, resistances, and a passive effect) over allies or foes, featuring platforming gameplay while exploring various missions. Both sides of battle have a leader, victory goes to the party who defeated their opponent’s leader. 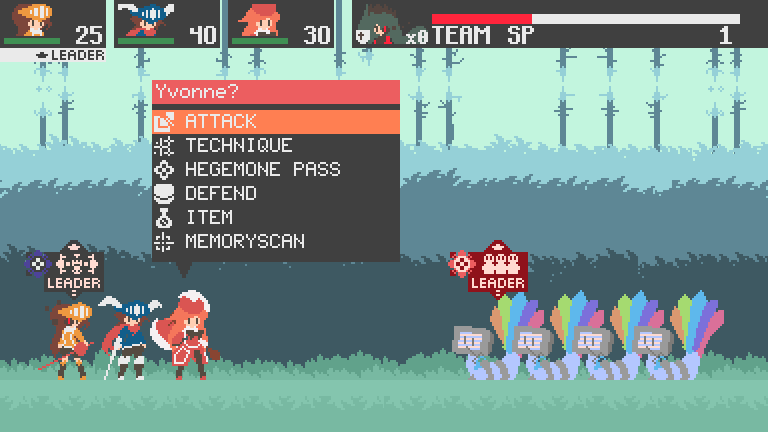 Both sides can switch the status of leader from one character to another during battle on to activate their title’s influence over the battlefield. The goddess Demeter has taken over the Underworld! The former Queen of the Underworld Persephone had her title stolen! Now she's being hunted by Demeter, who orders the entire Underworld to capture Persephone, in order to harness Persephone’s hidden secret and become the supreme ruler of humanity and rule over the Pantheon, the home of the gods! While in hiding, a distress summoning of Persephone occurs! Temporarily escaping from the Underworld, Persephone manages to save three humans from the Surface from an invasion of the Empire, Yvonne, Ethan and Emilie, members of the barbaric tribes of Icaune. For having saved their lives, Persephone asks in exchange for their help to help her reclaim her title and retake control of the Underworld, by collecting the five Order Flowers in order to weaken and defeat Demeter. To do this, Persephone resides inside either Yvonne, Ethan or Emilie, allowing them to manifest the power of their title and lead their team fight against the controlled forces of the Underworld. 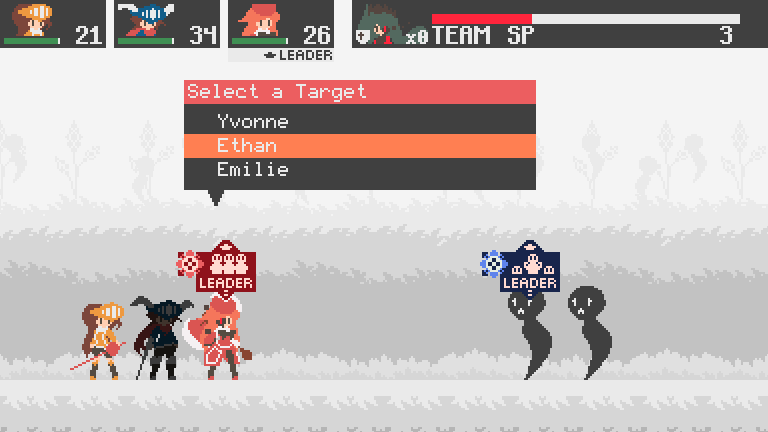 Persephone can move in between Yvonne, Ethan or Emilie at any time to change which title she needs to activate to change their approach in battle. Former Queen of the Underworld. Next in-line for the leadership of the Hardiesse tribe. A student of the Savoir tribe, brother to Emilie. A soldier of the Savoir Tribe and sister to Ethan. Goddess of Harvest and Life, and currently the Queen of the Underworld. 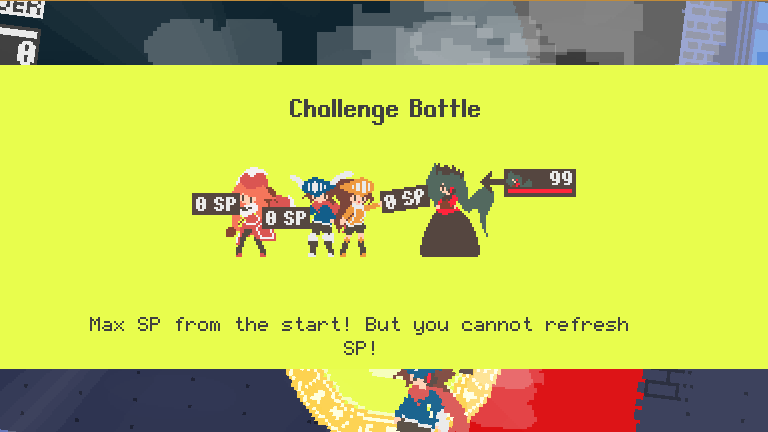 The battle system uses a classic turn-based RPG system. And so, you choose your party’s actions before they act, with speed being a determining factor in who goes first. Unlike most RPGs though, your party uses a shared pool of SP (Spirit Points). SP is used for performing certain techniques and magic spells of all sorts. SP regenerates every turn, with each conscious ally contributing a certain amount of SP per turn. 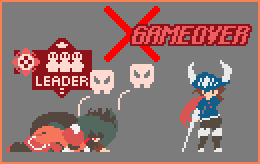 You gain EXP from defeated foes, whilst undefeated foes give less EXP if the enemy leader is defeated before his allies. 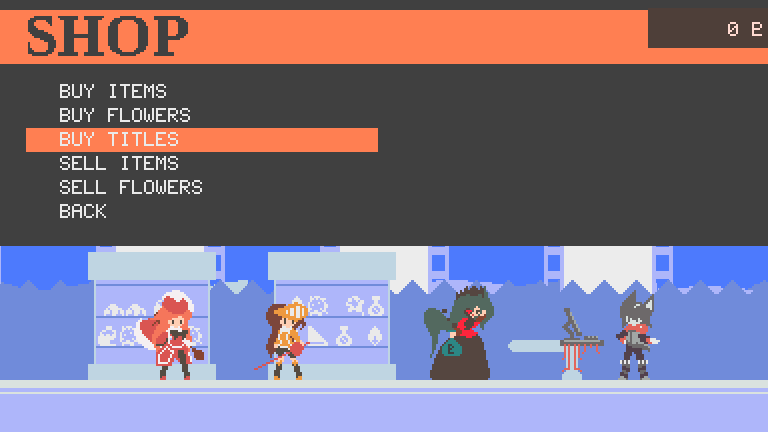 Your party shares the same exp bar and, as a result, levels up at the same time. In addition, you can scan your foes with the “Memory Scan” command, which enables you to register the enemy’s entry in your encyclopedia. This allows you to see the enemy’s description, weaknesses and enables the display of the enemy’s current health in battle. 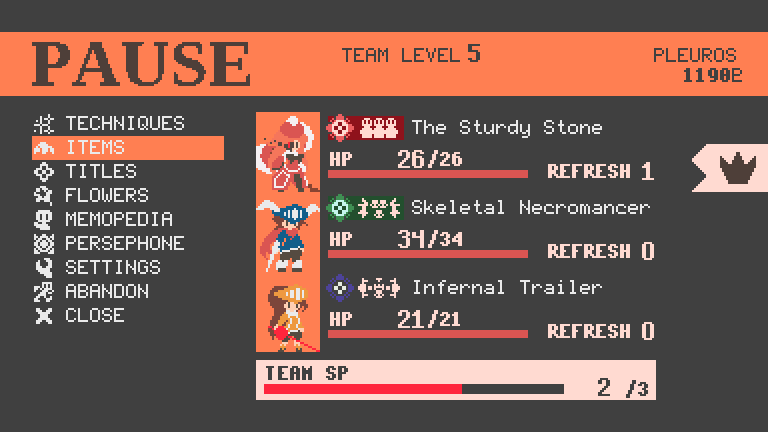 In battle, each side of battle has a single designated leader (On the player's side, the current leader will have a miasma eye, similar to Persephone's miasma eye, when they are leader). 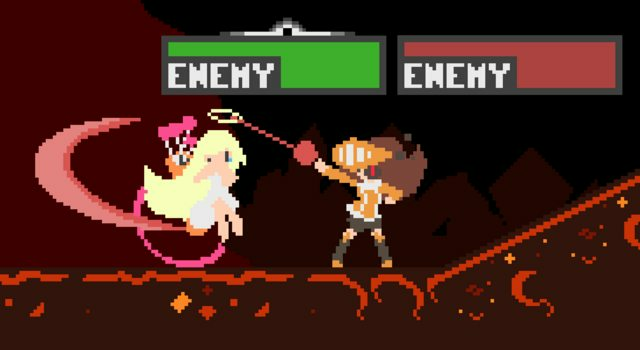 The goal in battle is to defeat the enemy team leader, while simultaneously trying to keep yours alive. When a unit is leader, they manifest their Title over others! An assortment of stat boosts and/or decreases. A passive effect imposed on the receiver(s) of the title’s influence. 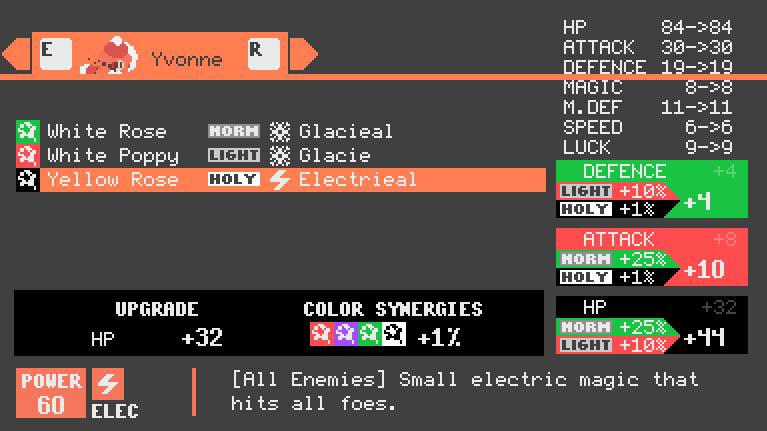 And, depending on the title, a set of **resistances **(or weaknesses). The effects of a title only manifest when one is the designated leader. 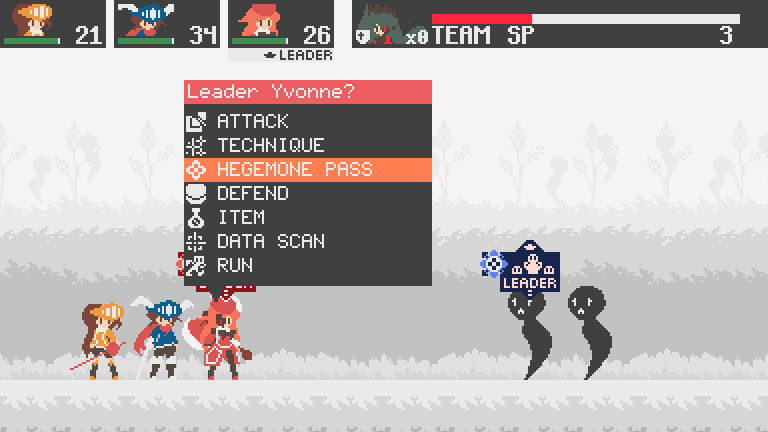 Any leader can pass their leader status to another unit using the “Hegemone Pass” command. Once that unit becomes the leader, their title’s influence overwrites their predecessor’s and it’s own effects come into play. Provides average stat boosts and elemental resistances for your entire party. Provides major stat boosts and elemental resistances for your party leader only. 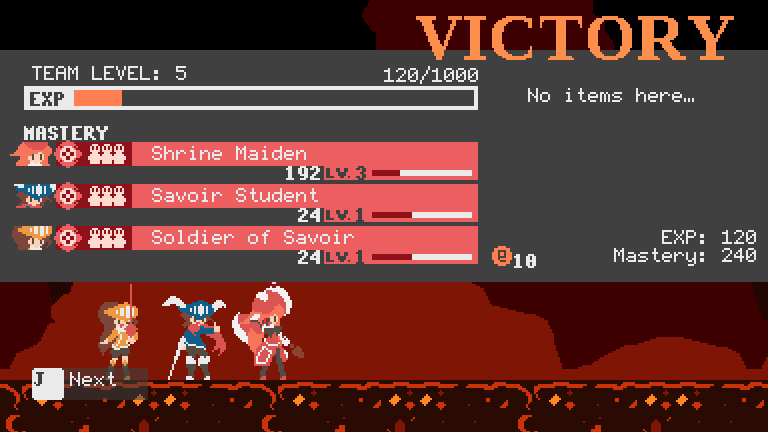 Imposes moderate stat decreases to the enemy team. Does not change their elemental resistances. 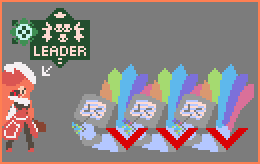 Provides major stat decreases to the enemy leader. Does not change their elemental resistances. 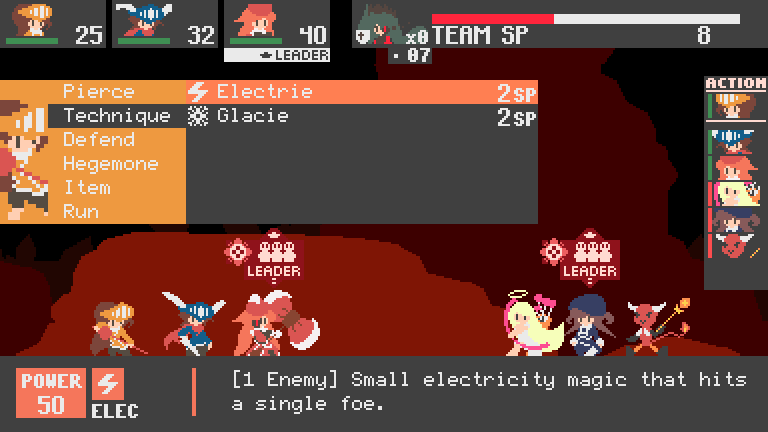 There are also techniques that force your team to change their leader, that can be used by ally or foe alike. 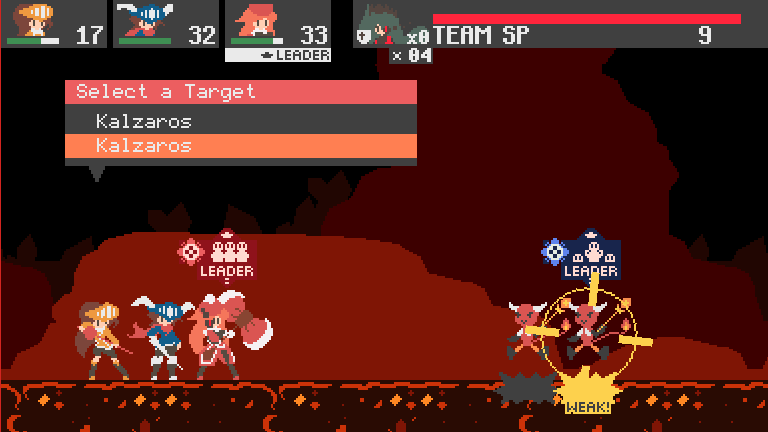 Also, certain techniques and status effects have different properties if the target is a leader. 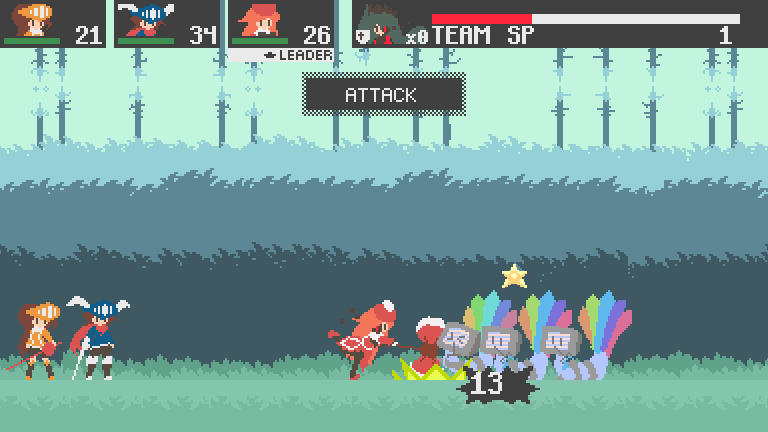 You can switch your leader to another ally if you feel the current one is low on health or might be weak to the attacks of the enemy. Your leader will always endure the first fatal hit in any battle. 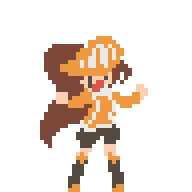 And lastly, if you have any 1UPs, your leader will be revived and the battle will continue. As long as your current leader isn’t KO’ed, the battle goes on. 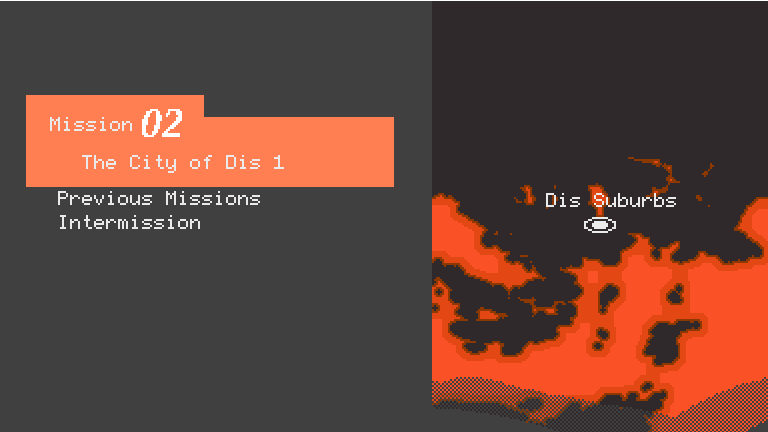 The game is divided into chapters, and each chapter has missions to complete. Missions send you to a level with an objective to complete. 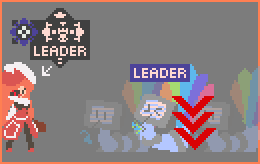 In a mission, you take control of the current leader and will be exploring the level which house various obstacles, while being able to switch leaders on the fly to use their different abilities. 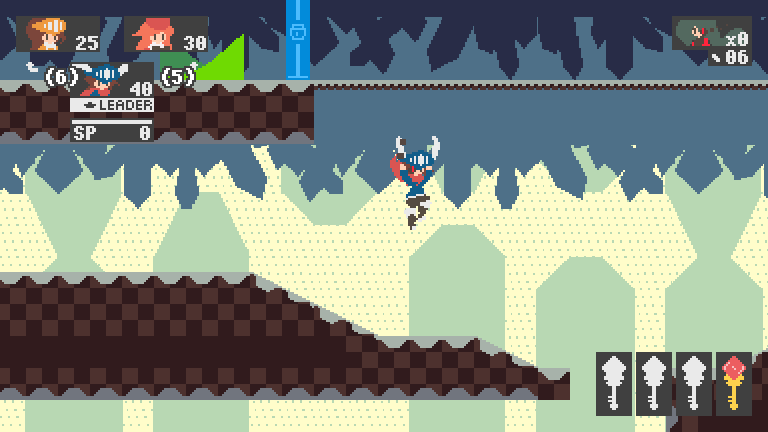 And throughout the level, you will find treasure chests containing various kinds of items, and small collectibles used for extra 1UPs available during battle. 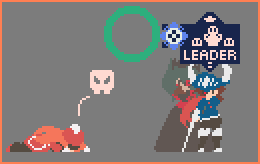 Enemy encounters are represented on the field. And if you enter their field of vision, they will chase you until you run far enough, or enter battle with them. When in contact with the enemy, you will be sent into battle, but you can get a “first strike” if you hit the enemy with your weapon on the field. In between missions, you will go to the Intermission. In the Intermission, you can buy items and equipment in the form of flowers from the Flower Shop, talk with your teammates about various topics, as well as choosing your next mission. 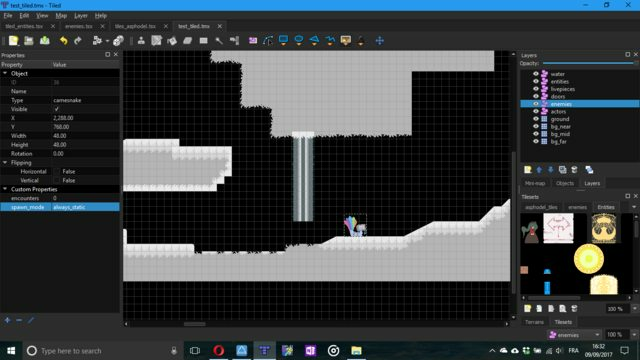 Most of the battle and platforming systems, as well as core mechanics, are done. What’s left to be done is the actual content of the game, with some extra features. 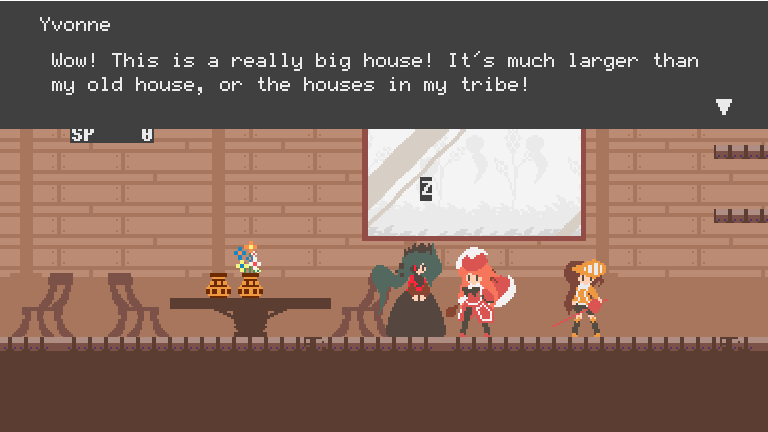 It’s mostly a solo project, I’m handling the programming and doing the pixel art. 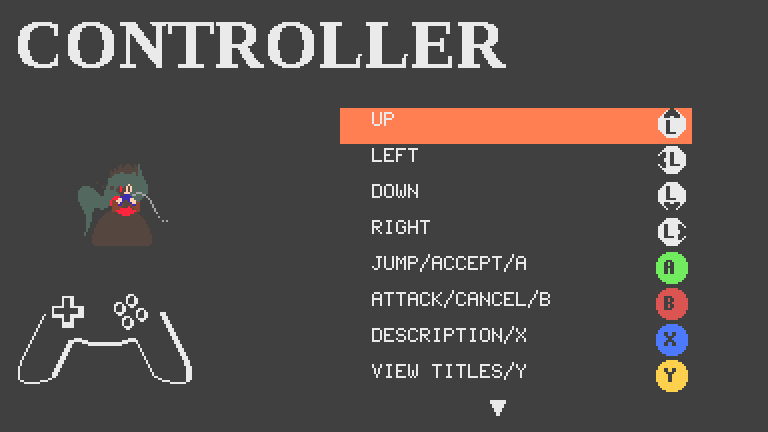 My brother is helping out by creating a database editor for the content of the game. All pictures shown above are not necessarily representative of the final product. 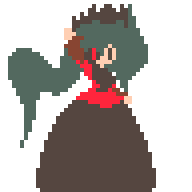 If you want to see more regular but unfinished progress, you can have a look at my Twitter profile, where I post gifs. Thank you for reading this devlog! Very neat art style. Unique! 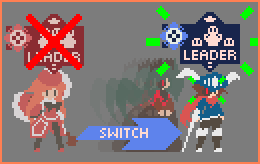 Today, I’m going to explain a bit more about Leader Switching. First, a little reminder. 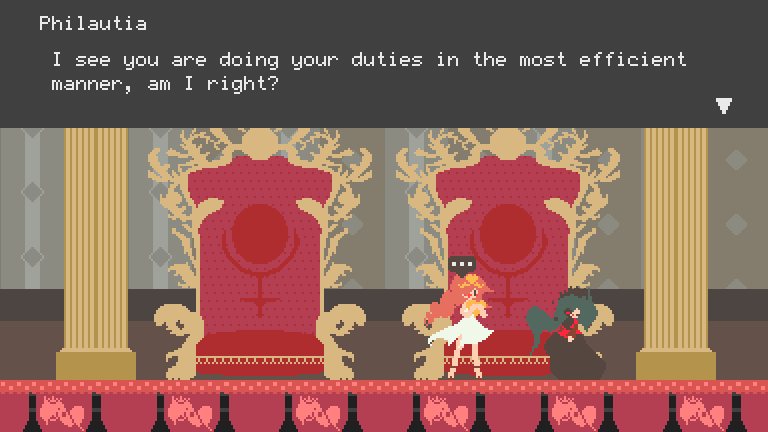 You play as Persephone, trying to find and defeat Demeter. As a result, Yvonne, Ethan and Emilie are not the leader, Persephone takes that position. However, whoever is hosting Persephone inside them is considered the party’s leader. On the field, you can switch your current leader when on land by pressing the leader switching buttons (bound to the E & R keys in the screenshot). This will make you switch your leader immediately to the character indicated in the HUD. 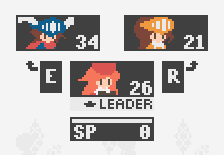 This UI element was inspired by the Sonic Heroes team formation hud. 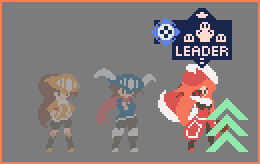 Switching leaders on the field allows you to do various things, but for today, I want to focus on leader switching in battle. You switch leaders by using the Hegemone Pass command. This command can be used by any party member, and when used it will prompt you to choose the character who will be the leader. 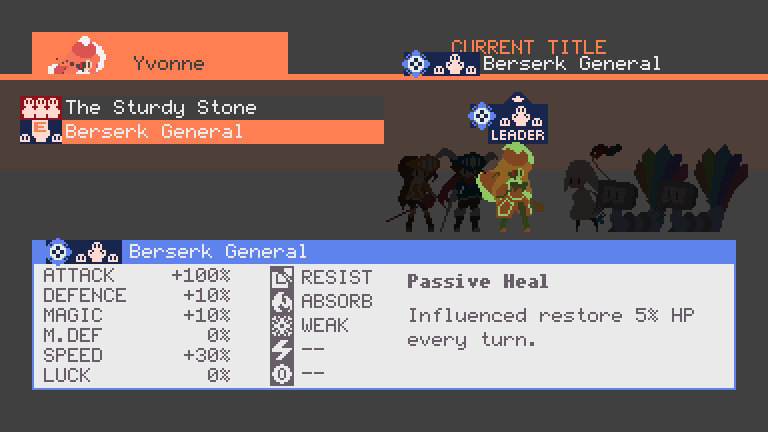 When the turn starts, the Hegemone Pass will switch your current leader to the designated ally. 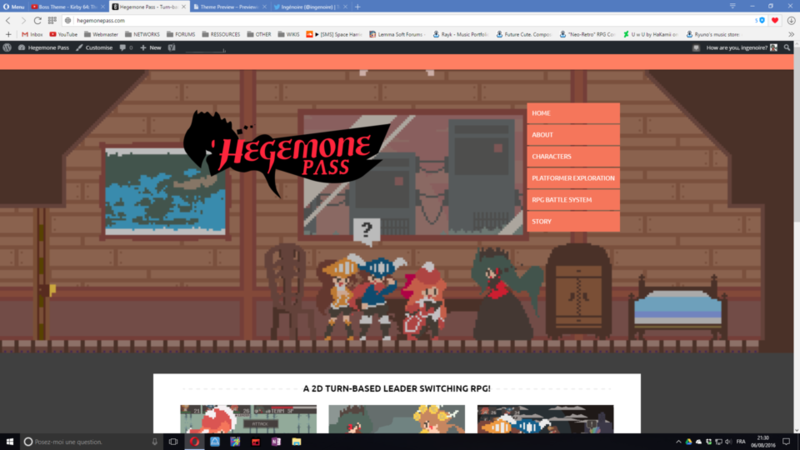 Anyone in your team can perform a Hegemone Pass, even when they are not leader, and in fact, you can perform multiple Hegemone Pass in a single turn, as it is a simple action like all the others. 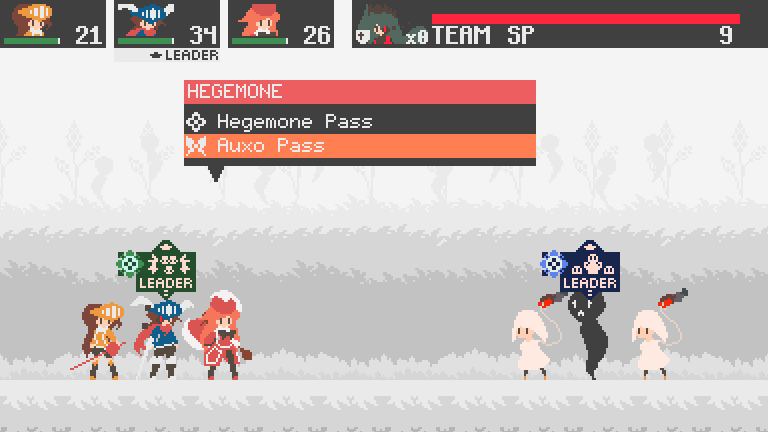 You’ll notice that during a Hegemone Pass, Persephone herself gets out of the previous leader, and enters the new leader! If you look closely, the miasma eye that Persephone has is shared when Yvonne, Ethan or Emilie host Persephone, but disappears when Persephone is outside of them. It reappears only on the new leader! 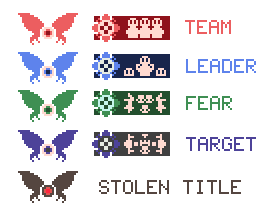 When switching leaders, a short description shows up, generally reflecting the most important aspect of the title as well as its type (Leader, Team, Target, Fear). 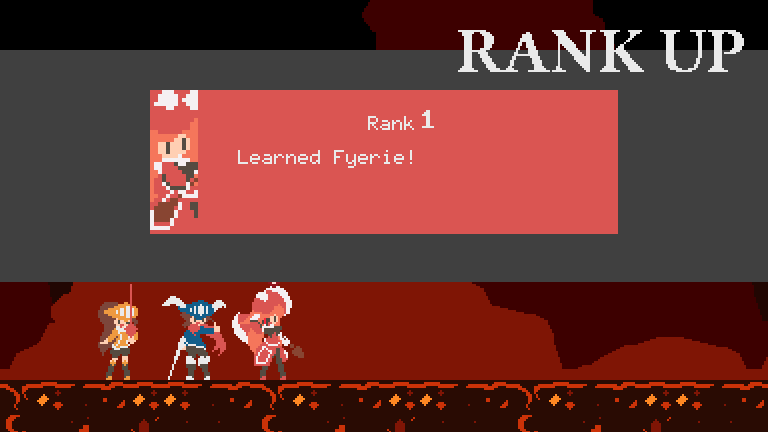 While it’s nice to know the title’s effect on the fly, you can also check each unit’s title at the start of each turn so you can know their effects beforehand, regardless of their leader status. When the enemies perform their own Hegemone Pass on their teammates, you’ll notice that Demeter is assisting them!... well, from afar. 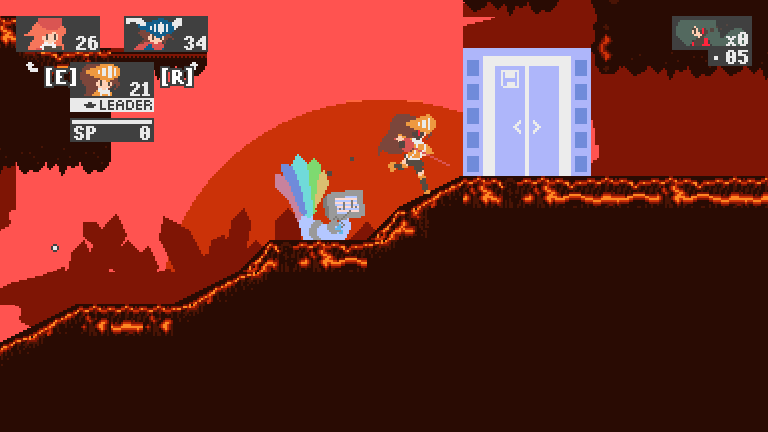 Demeter is much more powerful than her daughter in her current state, and can assist Persephone’s foes without being there, while Persephone has to physically be within the leader, and will be knocked out if the current leader is knocked out, rendering Persephone vulnerable to the Underworld under Demeter’s control. The Auxo Pass allows you to switch your opponent’s leader to the designated target! One great thing you can do is switch their leader so that a title you can take advantage of is applied, making your fight easier! Or better yet, switch their leader to one of their weaker allies, and finish them off for a quick victory! But beware! Some foes have the capabilities to do this to your team! 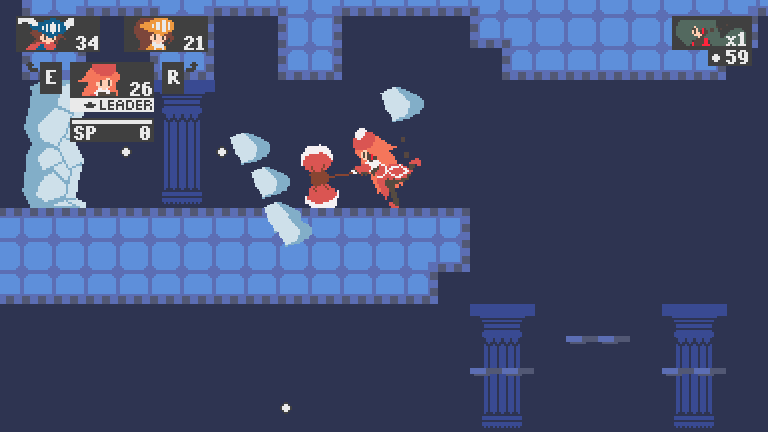 Additionally, some enemies will counter your Auxo Pass by performing a Hegemone Pass back to their leader of choice, so be aware! Currently, the only leader switching move that uses 0 SP to cast is the Hegemone Pass. 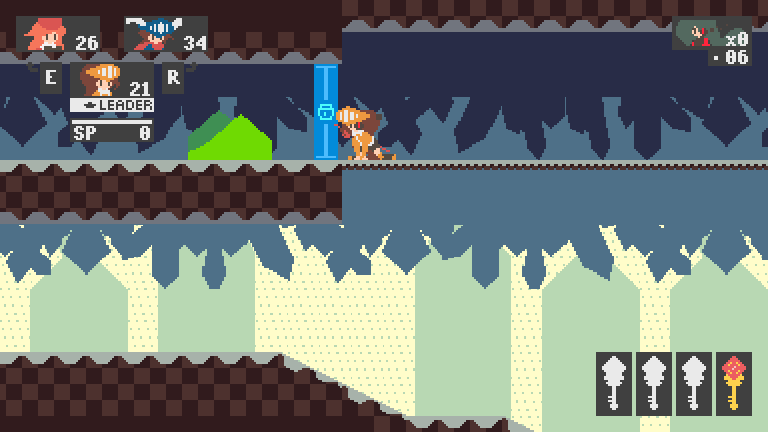 I am still deciding on how much SP it would cost to use an Auxo Pass (also, debugging, so 0 SP in the screenshots). In addition, I do think I’ll tweak the animation so that you can at least discern who is initiating the Auxo Pass, since right now it does look a bit similar to the Hegemone Pass when seen without context. Maybe like a eye spark on the user with a camera pan to it before the animation? In addition, did you notice the command selection HUD? 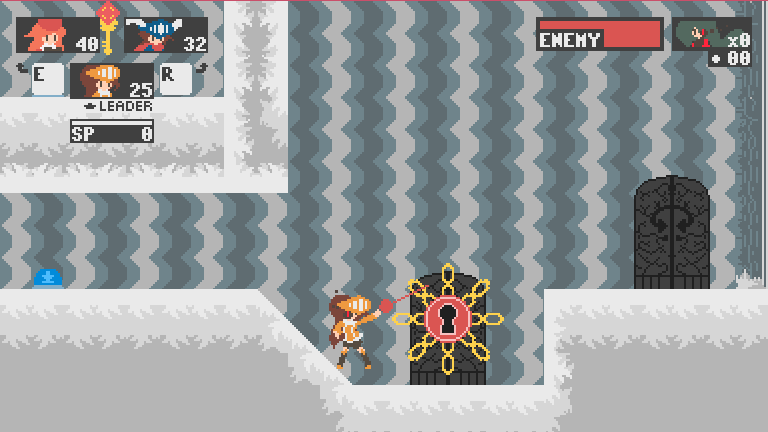 At the start of the game, you will only have access to the Hegemone Pass, to make sure players can understand the mechanics enough. 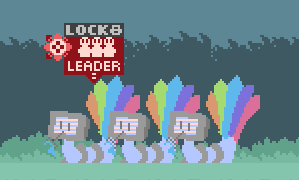 When you obtain the Auxo Pass, the command name changes to Hegemone, and opening it will reveal a list of leader switching techniques. More leader switching techniques can be found, but I’d like to keep them for another time. 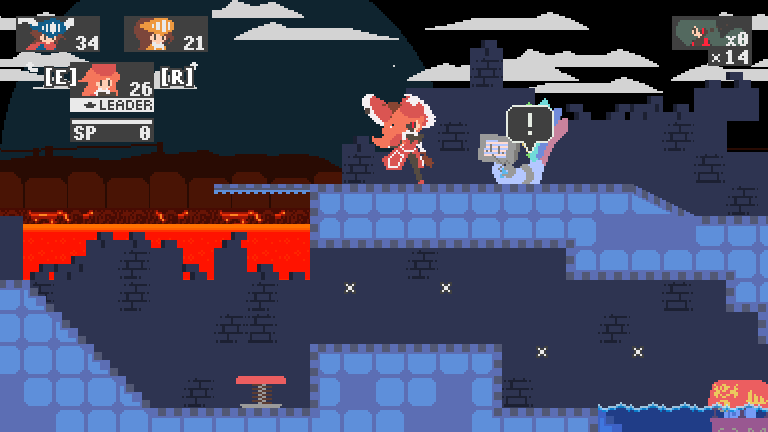 The only way you can get these techniques is by finding some of Persephone’s Minor Titles, upgrades that can be seen in the field of certain levels. These minor titles can grant you various upgrades, like lava walking, but also things like unlocking new Leader Switching abilities in battle. One last thing of note! There might be certain encounters where the enemy leader is locked, and therefore, cannot be switched at all. They will always remain leader, no matter what. 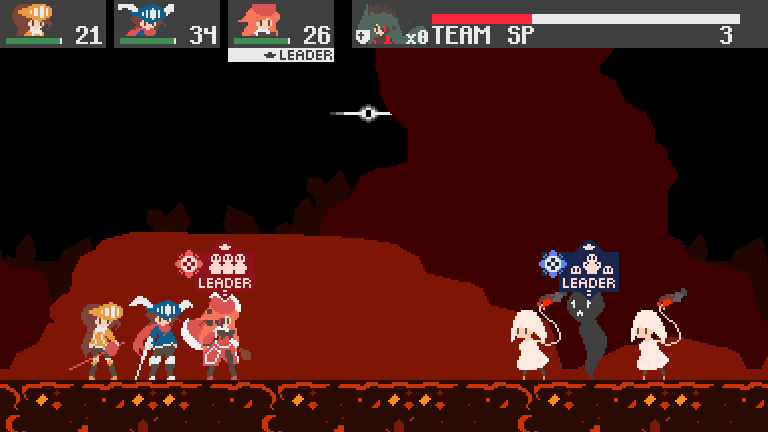 This is shown with a locked icon above the leader icon in battle. 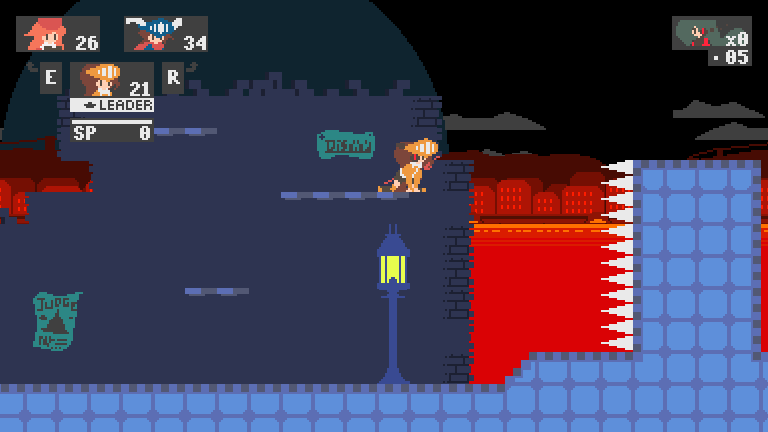 I'm always a nitpicker but there is one thing that really throws off the beautiful flat-shaded artstyle, the lava. As well as breaking the "one color per material" thing that makes this look so great, there's some serious banding going on as well. Disregarding that one tiny thing, I'm really looking forward to seeing more from this game." 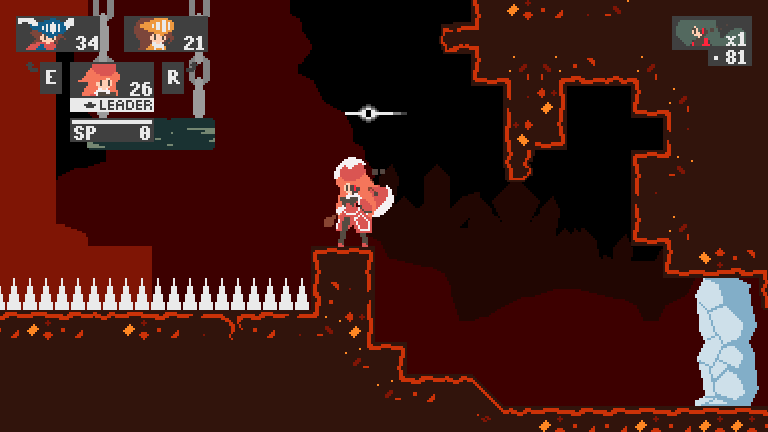 -> Yeah, the lava area is one of the tilesets that need a rework as a whole. 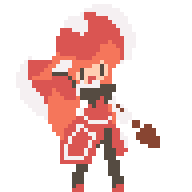 I’ll try experimenting with less shades for lava. I still need to convey with that tileset the idea of a "typical" underworld depiction, since it’s very early on in the game, before introducing more “unheard” of locations. 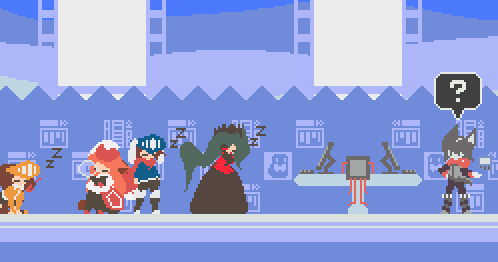 Thank you for reading this small update! 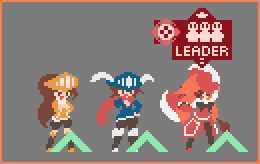 Next update would be up more quickly than this one, and it will focus on the method of obtaining new leader titles. Notice: Until I figure out the legal aspect of contracts and all that, I won’t be able to hire any music composer or promo artist. I haven’t responded to some propositions as a result of this, but please note I did receive some offers, and will keep them in mind until the legal aspect is figured out. However please do send your offers, so I have a good selection for when I need it. Really like the look of your project. Looks very ambitious as well! Small update! It's not any real details of the game, so it's not technically update #2. I'll be working all of August for the exams of the french school 42. 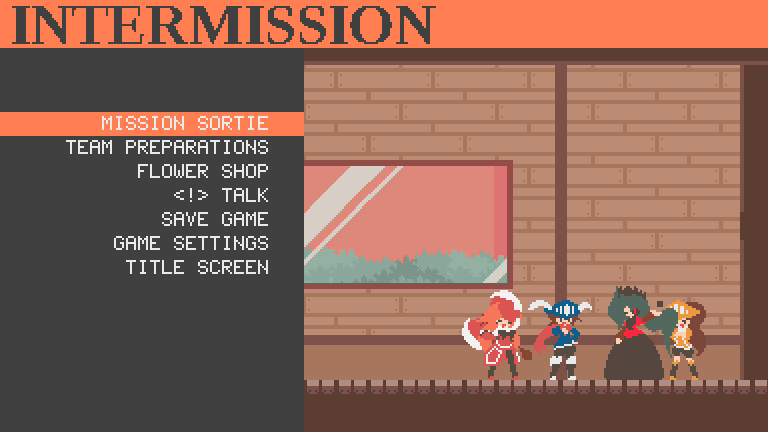 During that time, I won't have much free time, and I won't be able to work on Hegemone Pass during this time! 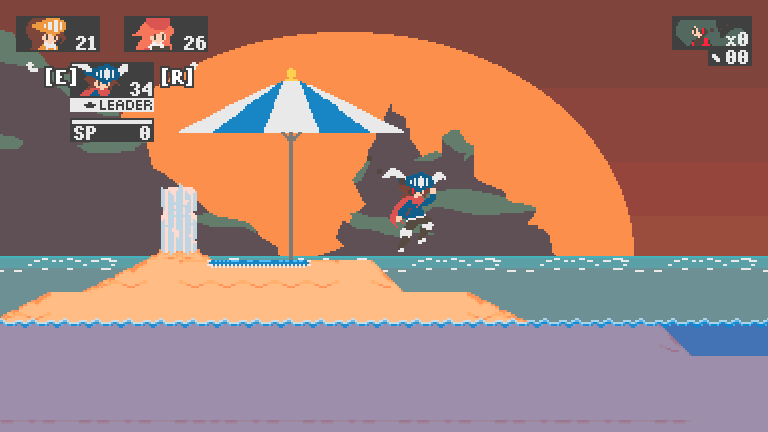 I'll still be able to look at twitter and the devlog, but no actual coding or spriting. Before I go, I just want to leave a small teaser gif, regarding the next update. 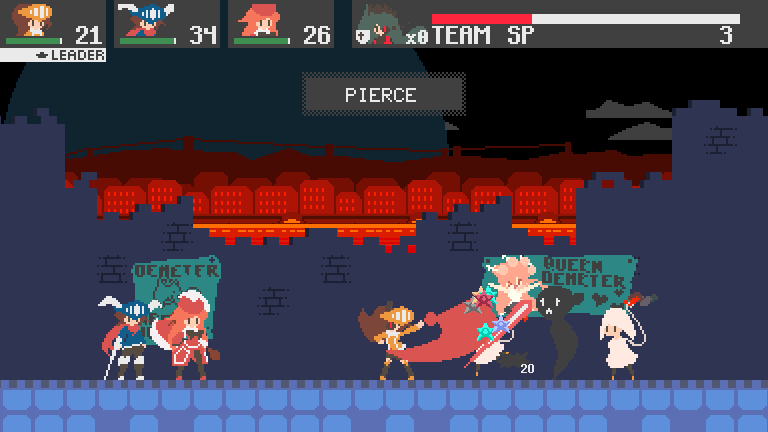 The next update's focus will be on the way you obtain new titles for your party members to equip.